Srinagar, Mar 21: Three policemen, including an officer, were injured in a grenade attack by militants in apple township of Sopore in north Kashmir district of Baramulla on Thursday. Official sources said that militants lobbed a grenade at a police party at village Warpora in Sopore, where a Cordon and Search Operation (CASO) was launched by forces in the wee hours of Thursday. “A Station House Officer (SHO) and his two Personal Security Guards (PSOs) were injured in the attack,” they said, adding that the wounded were immediately rushed to a hospital. They said the attackers managed to escape from the spot during the chaos created due to the explosion. 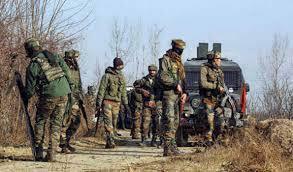 “Security forces have extended the cordon area and house-to-house searches were going on,” they added.